Few times when we decide to take a backup of our Windows setup CD/DVD on our hard disk, we just copy all the files and folders present in the disk to our hard disk partition. In future if we don’t have the disk with us, we try to create a new setup disk by burning the backup files and folders on the new disk. But the new disk doesn’t work and you can’t boot using it to run the setup. This is because the setup is not bootable. 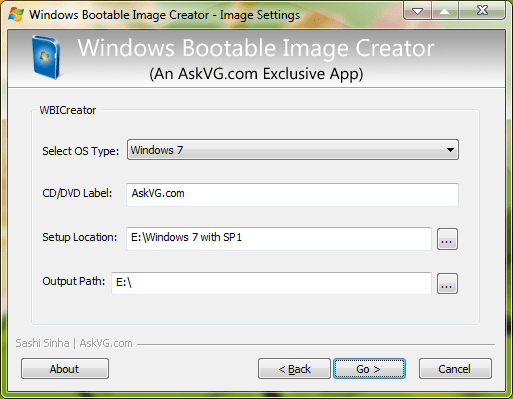 WBICreator” (Windows Bootable Image Creator) is a portable utility created by AskVG reader “Shashi Kumar Sinha” which allows you to create bootable ISO image file of Windows XP/Vista/7 setup. You just need to give any desired name to ISO image file, select the folder containing Windows setup files and select the target folder which will store the new ISO file and you are done. Just sit back and the bootable ISO image file will be created automatically within a few minutes which can be burned on a disk using any CD/DVD burning software. Tech Tip : Get an easy remote access to your windows applications and data and retain your windows desktop environment from anywhere on any device(PC/android/iOS) using high performance citrix xendesktop with unbelievable citrix xendesktop pricing in the market. To know more about hosted SharePoint, Exchange, MS Project Server and Azure managed services, visit Apps4Rent.com.